Every Monday, I go to my happy place...Kroger! Right now is my favorite time of the year and I look forward to going to the grocery store. Why? Because there is always a new pumpkin treat to discover or an adorable owl coffee mug, candle holder, etc. 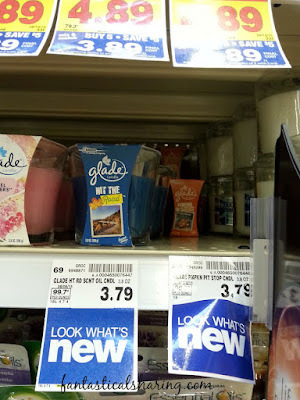 I try to steer clear of our candle aisle because I have a candle problem, but I saw the little blue “look what’s new” tags walking past and had to stop! 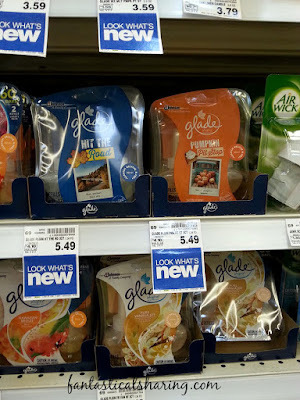 I picked up a few of the new Glade® Limited Edition Fall Collection Fall Scents goodies and couldn’t wait to go home to make my house smell all autumn-y. I picked up a pack of each of the new scents of the PlugIns® scented oils - Hit the Road™ and Pumpkin Pit Stop™ - and I picked up a Pumpkin Pit Stop™ Jar Candle. Our Kroger is currently moving stuff around, so that stuff is categorized in the aisles in a more common sense way, so unfortunately I cannot tell you the exact aisle number you can find these on. But you know your Kroger store - these lovelies are in the candle aisle. It only takes five ingredients to make these pretzels: white chocolate melting wafers, pumpkin pie spice, red and yellow food coloring, and pretzels. It is a very easy recipe to make and very kid-friendly. Matthew and Cami really loved making them. They both really like to stir things. I find this pretty hilarious because before Nick (my husband) could cook, his way of helping me cook was to stir things. Culinary skills start somewhere, right?! These pretzels are the perfect fall snack. They are salty and sweet. Crunchy and have that yummy spiced pumpkin flavor to them. My first batch barely lasted a day. Obviously, I will have to make some more! So how are they made? Read on! The first step is to take half the bag of white chocolate melting wafers (approximately 6 oz.) and melt according to the package directions. I microwaved 30 seconds at half power and then stirred. Then I microwaved for 15 seconds at full power, stirred, and repeated one last 15 second increment. Next, add 1 tsp. of pumpkin pie spice, 4 drops of red food coloring, and 8 drops of yellow food coloring. Stir well. If you have kids helping, I advise doing the drops of food coloring yourself and making sure they are careful while stirring. Food coloring + kids can be a wicked combination! Drop a couple pretzels into the melted chocolate and use a fork to coat them evenly. Tap the handle of your fork on the rim of the bowl to get rid of the excess chocolate. My kids LOVED this step. We may or may not have been doing a little dance with our tapping! Place coated pretzels on a parchment paper-lined baking sheet and cool in the refrigerator until set, about 20 to 30 minutes. After the pretzels have cooled, melt half of what remains in the bag of melting wafers (about 3 oz.) using the same instructions as before. Now I have to share a foolproof way of getting the melted chocolate into a piping bag (or frosting for next time you make cupcakes!) without all the hassle and mess. Place a Ziploc® bag or piping bag into a glass or mason jar. Fold the top over the lid of the glass. Spoon the melted chocolate into the bag. Then seal the bag and snip the corner or end, if using a piping bag. Pipe the melted chocolate over the pretzels. Then cool until set about 15 to 20 minutes. Store pretzels in an airtight container and keep in a cool place or in the refrigerator (which I prefer!). I’m so glad that I had these pumpkin pie pretzels to curve my pumpkin craving, at least in the moment! Now I’m starting to wonder if I’ve not been craving foods from what scents have been in my kitchen?! I thought it was just seeing pictures of food or watching cooking shows on tv that made me crave things! Am I alone here? Melt half the bag of white chocolate melting wafers in the microwave according to package instructions. I did mine at half power for 30 seconds, stirred, and then heated for 15 second increments at full power, stirring between each increment. It took me 1 minute total to get mine completely melted. This will depend on your microwave. Add 4 drops of red food coloring and 8 drops of yellow food coloring plus the pumpkin pie spice and stir well. Drop a couple pretzels in the chocolate at a time. Use a fork to coat the pretzel and then knock handle on the “lid” of the bowl to knock off excess chocolate. Place dipped pretzels on a parchment paper lined baking sheet. Once all the melted chocolate is used or desired amount of pretzels reached, place baking sheet in refrigerator to cool until chocolate is set, about 20 to 30 minutes. Melt half of what is left in the bag of white chocolate wafers using the same instructions as above. Place a small Ziploc® bag or piping bag into a glass with the top of the bag folded over the rim of the glass. Spoon melted chocolate into bag. Seal and cut a small piece off of one corner (or end of piping bag). Pipe chocolate onto the cooled coated pretzels. Return to fridge to cool until set, about 15 to 20 more minutes. Keep in an airtight container in a cool location or in the fridge. If you are interested in these new Glade® Limited Edition Fall Collection Scents, you can find them at your local Kroger in your candle aisle. They collection has jar candles, PlugIns® Scented Oils, wax melts and Premium Room Sprays. 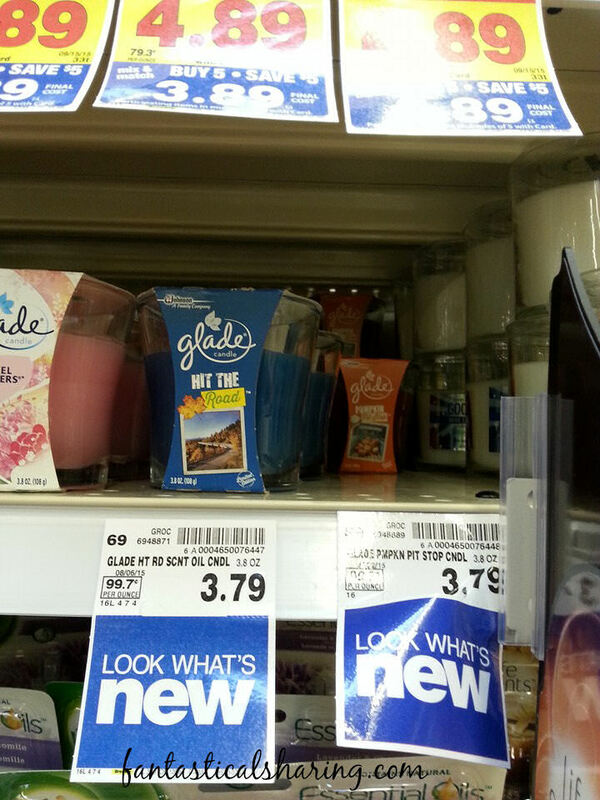 Visit the Glade® website for more information.